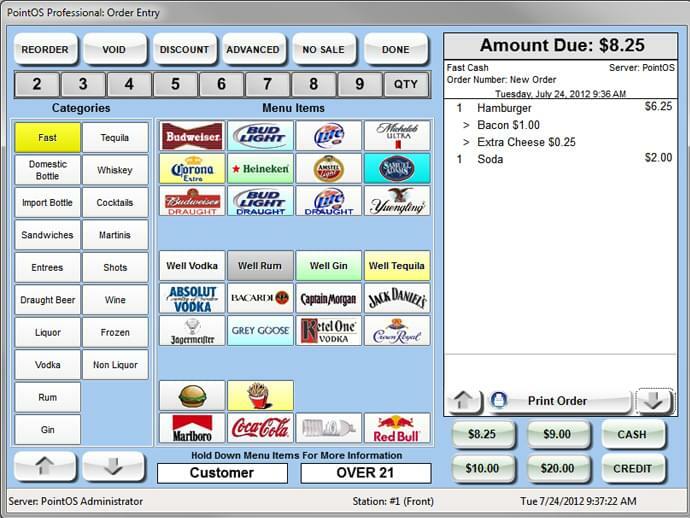 A privately held firm in Vero Beach, Florida, ShakenSoft LLC is the creator and distributor of PointOS, a point-of-sale software solution designed specifically for bars, restaurants and night clubs. Founded and run by a team with years of experience in the hospitality industry, ShakenSoft’s first product was BarOS, which catered to bars and night clubs exclusively. The company extended the product’s capabilities and renamed it PointOS in 2008, when it added more restaurant-specific features into the program. PointOS is POS software designed for the hospitality industry. Main features include the ability to process multiple servers at a single station, UPC bar code scanning, printing to another location such as the kitchen or a service bar, the ability to split checks, credit and debit card processing, automatic happy hour pricing, and programmed and custom discounts. This point-of-sale software also supports an employee time card system and cash drawer stations, and it can generate payroll reports. PointOS offers an integrated music function, which features touchscreen playlists and can interface with Windows Media Player, as well as automatically find music and request songs from a variety of sources. This point-of-sale solution provides tools for management, including the ability to integrate with QuickBooks and Excel, sale report generation, automatic archiving, inventory control and management functions and more, all from the system’s dashboard. Learn everything you need to know about ShakenSoft PointOS. Our experts will reach out to you shortly.